John left a comment on my recent post about magic-users drawing my attention to a document he put together: Dying Earth Spells for D&D. (Here’s a direct link to the PDF for people that don’t want to deal with Scribd.) This is perhaps the best collection of spells I have seen. Here are some of the spells: The Howling Rune, The Manifold Effigies of Being, The Spell of Celeritous Relocalisation. There were enough entries that I assumed the document was just a list of spell names. Imagine my delight as I scrolled down and realized that this free document contains 30 fantastically named spells per level (up to 6th, which God intended to be the highest level of magic-user spells). That is 180 spells, and every single one has a description. And further, they are all written concisely, in a format that I can imagine no way to improve upon. Save vs. spell or slip and fall. If cast on item then save or drop immediately. Even better, it is organized by level, not alphabet. This entry was posted in Spotlight and tagged magic-user on August 21, 2012 by Necropraxis. 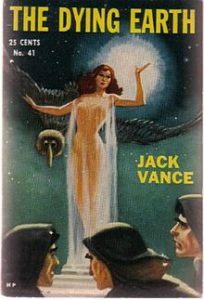 I ought to make it clear that not every spell name is my own work – asides from the ones copied directly from Jack Vance, there are a few from the Empire of the Petal Throne and other sources. While awesome, I’m afraid that I would be unable to pronounce 1/2 of them. I was hoping to find Larodrm’s Leap Of Logic spell on the list. Sigh. @Alex: I do use a pseudonym, but only from old habit because my real name is so unique. I’ve uploaded a revision with my email address and some typos fixed. @Aaron: It wasn’t tagged with Dying Earth or Vance, so I never found it, or else it probably would be. Feel free to use it, if you like. Great job on the list of spells by the way, they almost uniformly had a great Vancian vibe to them. Amazing! This is an invaluable resource for an OD&D DM and I think I’ll be using this list exclusively in my games! Its got all the usual D&D spells (with much better names) plus a joyful truckload of evocative new options. I’m a huge Vance fan and this is just brilliant! Thank you! It seems to have not picked up my id, but I’m CodexArcanum on RPGnet and most other places. @John — I cannot express how excited I am to see this list. Wow! Thank you for sharing! This IS the spellbook for my new campaign. Well done!